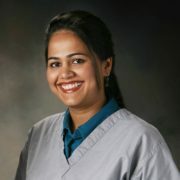 Supriya Shetty, DDS is a graduate of New York University School of Dentistry. Since joining Integrative Dental Solutions in 2007, she has completely embraced the concept of holistic dentistry. Dr. Shetty is a member of the Huggins Alliance, the International Academy of Oral Medicine and Toxicology (IAOMT), the International Academy of Biological Dentistry and the International Association for Orthodontics. She is also great with kids and one of her specialties is children’s dentistry. Originally from India, Dr. Shetty lives with her 3 kids and husband in Brookfield, WI. Her hobbies are traveling and music and she is fluent is several languages. She is a firm believer in continuing education and is continually working to improve her dental skills.